We made the list yet again! We're number 382 out of 400 top printers in the country. This is the EXTENDED CUT of our first ever television commercial. We produce marketing materials for most of the entrepreneurs and small businesses in the midwest and nationwide. We thought, what a better way to promote, than with the very first entrepreneurial role... a lemonade stand. We wanted to show you how we provide... printing simplified. We hope you enjoy it! We made the list again! We're number 390 out of 400 top printers in the country. This is our first ever television commercial. We produce marketing materials for most of the entrepreneurs and small businesses in the midwest and nationwide. We thought, what a better way to promote, than with the very first entrepreneurial role... a lemonade stand. We wanted to show you how we provide... printing simplified. We hope you enjoy it! The Komori Impremia NS40 sheetfed inkjet press equipped with Landa Nanographic technology. ROLLING MEADOWS, Ill. — May 16, 2017 — Komori America Corporation announced that M13 Graphics has signed a letter of intent to purchase the Komori Impremia NS40, a sheetfed inkjet press equipped with Landa Nanographic technology. After researching the capabilities of the Impremia NS40, Dan Banakis, president of M13 Graphics, traveled with his team to drupa 2016 to see the innovative digital printing system in operation. M13 Graphics has become a national leader in online and commercial printing services by offering high-quality, fast and affordable printing services. The M13 Graphics team found the Impremia NS40 to be a perfect fit for the company as the Impremia NS40 produces offset-quality brilliant color and will help M13 expand its high quality on-demand business. An additional key driver to signing a letter of intent for the press was the combination of the offset color quality and the flexible benefits of digital that will allow the company to add new capabilities like variable data printing. Banakis reports he plans to transition a large portion of the company’s offset and digital work to the Impremia NS40 once it is installed to offer their customers even more savings in both time and money. The Impremia NS40 is built on a Komori platform and uses Nanographic developed water-based inks, making it energy-efficient and eco-friendly. The press prints on a variety of substrates — such as coated and uncoated paper stocks, recycled carton, newsprint and plastic packaging films — without requiring any kind of pretreatment or special coating. 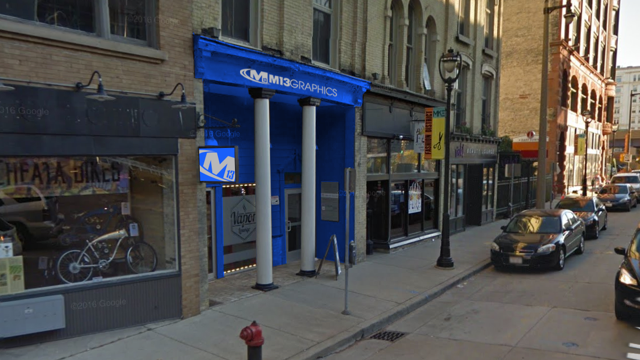 M13 Graphics is Now Open in Milwaukee! Stop paying for shipping and waiting days for your order to arrive from “another” printing company… Order today at M13.com and pick it up in Milwaukee as fast as tomorrow. We are located in the heart of Milwaukee at 522 North Water Street. Illinois printing company M13 Graphics chose downtown Milwaukee for its second retail location as it tries to generate more business in Wisconsin. The company leased the first two floors of 522 N. Water St., a building owned by Rich Meeusen, CEO of local manufacturer Badger Meter Inc. Dan Banakis, president of M13 Graphics, said the printer will open shop in early April with a location that will serve the dual roles of a pick-up spot for printing orders, and an advertisement to the Milwaukee business community. A rendering shows M13's plans for its North Water Street location. “It’s going to give us a presence where people in the area will see it,” he said. The business is based in Schaumburg, Ill., and also has a retail location in downtown Chicago. It prints business cards, brochures, fliers, marketing materials and other items, Banakis said. Its staff of about 38 people handles in-house graphic design and the actual printing. The vast majority of its business is from Illinois clients, but Banakis sees potential to pick up more work in the Milwaukee area from restaurants in the 3rd Ward, for example. The business also could open similar locations in St. Louis and Indianapolis, he said. Banakis said he’s “excited” about things happening in downtown Milwaukee, and signed a five-year lease for the Water Street space. Meeusen, he said, has explained the plans to convert nearby East Clybourn Street into a two-way boulevard, and for the Lakefront Gateway infrastructure project a few blocks away from his Water Street storefront. Later this year, an extended stay Homewood Suites by Hilton hotel will open in the restored Button Block building a few doors south of M13’s storefront. The Milwaukee storefront will open with limited hours, but could expand over time to possibly have in-house graphics designers to work directly with clients, he said. For the third year in a row, M13 Graphics has made the Printing Impressions 400! SCHAUMBURG, Ill. — Print service providers face intense pressure these days to deliver finished products in ever-shorter timeframes. M13 Graphics has made a name for itself nationwide through its ability to produce exactly what customers need when they need it. For the first time, M13 Graphics has officially made the 2012 Printing Impressions 400 list! This list provides the industry’s most comprehensive ranking of the leading printing companies in the United States and Canada. This list was published by Printing Impressions Magazine which serves the printing industry nationally. According to Manta.com, there are 365,753 printing companies. That puts us in the top 0.1%!